Have you been prescribed Enterogermina? 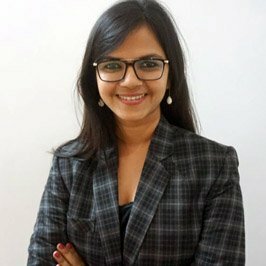 Do you wish to know what Enterogermina is and how it works? Wish to know about its side effects or have any doubt about its dosage? Continue reading a brief overview to get basic information followed by detailed information on Enterogermina. Probiotics are the good bacteria that help in managing a healthy gut microflora. Enterogermina is a branded oral anti-diarrheal probiotic medicine that is manufactured and marketed by Sanofi India Ltd and is available as an oral capsule and an oral suspension. Enterogermina is composed of two billion spores of Bacillus Clausii. Bacillus Clausii are antidiarrhoeic microorganisms. These bacteria are resistant against multiple antibiotics. They benefit human body by improving intestinal microbial balance and are prescribed in condition like diarrhea where there is loss or imbalance of good bacteria in the intestine. Enterogermina is generally prescribed to address health issues like Bacterial Gastroenteritis, Amoebic dysentery, IBS or Irritable bowel syndrome, inflammatory bowel disease, Gastroenteritis, Colitis, Bacterial Vaginosis, Traveler’s diarrhea, Lactose intolerance and Respiratory tract infection. Prolonged use of antibiotics can also lead to diarrhea as antibiotics can kill the healthy bacteria that reside in our intestines. As mentioned earlier Enterogermina is available as an oral suspension as well as capsules. Oral suspension may be used by both adults and children whereas capsules are for use in adults only. Enterogermina oral suspension is available as 5ml mini bottle. The normal suggested dose of oral suspension for an adult patient is 3 to 2 units of 5ml mini bottles in a day. For children or infants the dose is about 1 to 2 number of 5ml mini bottles in a day. For capsules it is 2 to 3 capsules in a day. Capsules are recommended for adults only. The dose may also depend on various factors. Consult your doctor for proper guidance on dosage details. The oral suspension may be used as it is or can be diluted in water or any kind of juice while consumption. In case of oral suspension shake the bottle well before use. Once opened it has to be consumed within 20 to 30 minutes to avoid contamination. Enterogermina is generally a safe drug to use. Side effects are very rare which may include stomach upset, flatulence, bloating. Rarely some patients may experience rashes and nausea. Consult your doctor if the problems persist. Enterogermina is not known to show interactions with any food items or drugs in general. Inform your doctor if you are using any OTC (over the counter) medicine or any antibiotic drugs or any health supplements to avoid any possible side effects. Enterogermina may not work properly if consumed along with alcohol. Pregnant and breastfeeding women also may use this medicine safely after consulting with their doctor. For infants follow the instructions given by the pediatrician. Check the label for proper expiry date and don’t use if expired or if the packing is damaged. When is Enterogermina not suggested? A single dose of Enterogermina contains 2 billion spores of Bacillus Clausii bacteria as an active ingredient. Bacillus Clausii is an antidiarrheal multi-antibiotic-resistant bacterium which helps in restoring the balance of healthy bacteria in the intestine. Enterogermina is manufactured and marketed by Sanofi India Ltd and available as both an oral capsule and oral suspension. In case you would like to also explore other probiotic options, few options are also available for an online purchase on sites like Amazon. Here is a useful link to view these options. However, before substituting these, you should check with your doctor if it is a right option. Each dose of Enterogermina contains nearly two million spores of Bacillus Clausii which helps to restore the balance of healthy bacteria in our intestines. In probiotic therapy like with Enterogermina, these beneficial microorganisms are ingested and thereby introduced to the intestinal microflora intentionally. This results in high numbers of beneficial bacteria which compete with harmful bacteria for nutrients and thus starve off harmful bacteria. Probiotics refer to the good bacteria that naturally reside in our body, usually in the intestines. When these healthy bacteria are depleted due to sickness, the balance can be restored by taking one of the many supplements available. These supplements mostly contain one of two most commonly used bacteria, namely Lactobacillus and Bifido bacterium. Your doctor may prescribe Enterogermina based on your health condition. Some health conditions like diarrhea or antibiotics usage may cause loss of healthy intestinal bacteria and form an imbalance in gut flora. Enterogermina may be prescribed for patients suffering from such issues to restore the healthy bacterial balance in the intestine. This is a non-exhaustive list and there may be other uses and benefits of the Enterogermina as well. Please do not use this medicine because someone has used it with similar symptoms. Please consult a doctor before using the medicine. Enterogermina is not suggested for use if the patient is allergic or intolerant to the drug. It is also not advised for patients suffering from Intestinal Perforation. Intestinal perforation is a condition of the GI tract characterized by a hole anywhere in the gastrointestinal regions. Patients suffering from liver or kidney related problems should take an advice from their doctor before taking Enterogermina. Certain restrictions may need to be adhered with to achieve optimal benefits and avoid side effects. Once the vial of enterogermina is open, it should be consumed within 15-20 minutes to avoid contamination. Alcohol consumption may alter the effectiveness of Enterogermina medicine. Inform your doctor if you have a habit of drinking before he prescribes you the medicine. In general, Enterogermina has not shown interactions with any food items. Your doctor may advise you to avoid certain food items that may further trigger the symptoms. Sanofi India Ltd manufactures the Enterogermina medicine. Ensure that you have checked the company name, manufacturing date and expiry date on the label. As a proactive customer, it is always a good practice to check the expiry date prior to purchasing any drug. Store the drug at room temperature, away from sunlight and out of child reach as a safety precaution. Enterogermina medicine need not be stored in a fridge. Dosage details mentioned here is for informative purpose only. It is advised to use this medicine under proper medical supervision only. The dosage of Enterogermina may vary with the patient’s age and medical condition. Consult you’re your doctor for dosage instructions. Oral suspension may be used by adults, children, and infants. Average dose for an adult is 2 to 3 vials in a day. Dose for children and breastfeeding infants is 1 to 2 vials in a day. You may use the medicine as it is or consume by diluting the content in water, milk or orange juice. When using suspension form, shake the contents well before use. Discard the vial if abnormal smell or colour is noticed or if the vial is kept open for a long time. Enterogermina may show resistance while using in combination with antibiotics. In such cases use Enterogermina between the doses of antibiotics. If you are using Enterogermina capsules, take them orally with water or any drink without breaking or chewing the capsule. Capsules are recommended for adults only. Dose is 2 to 3 capsules in a day. In very rare scenarios, in addition to its intended benefits, Enterogermina may cause some unwanted effects too. Consult your doctor immediately if you suffer any such side effects and if they do not get cured soon. Rarely, Enterogermina may result in mild stomach upset in some patients during initial days. Consult your doctor at the earliest if the symptoms don’t reduce after a few days. Enterogermina is a very safe medicine to use. It contains only healthy bacteria that help to balance gut flora. Consult your doctor if you suffer any serious acute toxicity symptoms which are very rare. Flatulence, Bloating and abdominal pain is common but are rarely observed side effects. Enterogermina is suggested only when there is an imbalance in the healthy gut bacteria. There is the least possibility of long-term use side effects since it is used for a fixed duration as directed by your doctor. Enterogermina may show very rare side effects like nausea and skin rashes. Consult your doctor if the symptoms continue for proper guidance. Enterogermina is not known to show any drug interactions. Still, it is a good practice to keep your doctor informed about other medicines or supplements you may be taking. It is not recommended if you have demonstrated a hypersensitive reaction to active ingredients in this medicine any time before. If you notice small lumps in the product bottle, these may be harmless clusters of spores. However, if there is any doubt, it is best to check with the pharmacist or doctor. Below listed brands are some with the same composition, strength, and form as of Enterogermina, and hence your doctor may prescribe any of them as an alternative to Enterogermina. 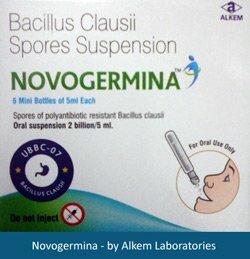 Novogermina 5ml Oral Suspension is manufactured by Alkem Laboratories Pharmaceutical Company. It is available in the same composition as of Enterogermina and in the same quantity. Your doctor may prescribe this medicine as an alternative to Enterogermina. It comes in a pack of 6 such mini bottles of 5ml each. Zeebon R 5ml Oral Suspension is manufactured by Wockhardt Pharmaceutical Company. It is also available in the same composition and quantity as of Enterogermina. Benegut 5ml Oral Suspension is manufactured by Abbott Laboratories Pharmaceutical Company. It is also available in the same composition and quantity as of Enterogermina. Gutspert 1gm is available in powder form. Each sachet contains 1 gram of medicine with 2 Billion Spores of Bacillus Clausii. This medicine is manufactured by Glenmark Pharmaceuticals. Can I use Enterogermina along with alcohol? Use of Alcohol can make Enterogermina ineffective vis-à-vis the desired benefits; therefore Alcohol consumption is not advised. Are there any food restrictions while using Enterogermina? No food interactions were found with Enterogermina. Your doctor may suggest to avoid some foods that may trigger stomach upset and diarrhea. Can Enterogermina be used in children and infants? Yes, Enterogermina can be used for treating children and infants depending on the health condition. Don’t self-treat. Use the medicine only when your doctor prescribes. Can I use Enterogermina during pregnancy? Enterogermina is considered safe to use during pregnancy. However, it should not be taken without advice from a doctor. 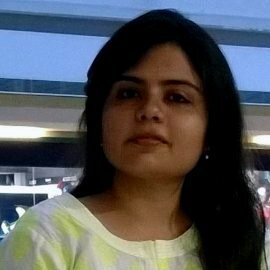 Can I use Enterogermina along with oral contraceptives? Enterogermina is not known to show any negative impacts with oral contraceptives. But you should always inform your doctor if you are using any such medicine before prescription. Can I use Enterogermina if I am a breastfeeding mother? Enterogermina is considered safe to use in breastfeeding mothers and no adverse effects are shown in feeding infants. Still, as a safety measure, you should always consult your doctor before using the medicine if you are a lactating mother. Can I use Enterogermina if have any kidney-related health problems? Can I use Enterogermina if have any liver-related health problems? Enterogermina is considered safe for use by patients suffering from any liver-related issues, but should not be consumed without a prescription. What is the dose of the Enterogermina? The normal recommended dosage for an adult is 2 to 3 bottles of 5ml Enterogermina oral suspension in a day. For children, it is 1 to 2 bottles. Capsules can be used only for adults and the dosage of Enterogermina capsules is 2 to 3 capsules in a day. Enterogermina is probiotic medicine. It is usually administered for the treatment of diarrhea. However, rarely, probiotics may cause an allergic reaction in some patients. The symptoms of allergic reactions may include stomach upset, bloating, diarrhea. This may happen during the initial days after starting to use the medicine. Consult your doctor if the symptoms prolong. Your doctor may alter the prescription in such conditions. What is the shelf-life of Enterogermina medicine? The shelf life of Enterogermina oral suspension is 2 years and for the capsules, it is about 3 years. Read the label carefully while purchasing to ensure that medicine has not expired, or the package is not damaged. Medicines anti-diarrheal probiotic, Enterogermina, Enterogermina dosage, Enterogermina Precautions, Enterogermina Side effects, Enterogermina Uses. permalink. I have H Pylori positive. can i use entergerminia at this stage, i have completed the therapy of antibiotics more than 3 months ago. How much dose i can use for how much days? Sorry, no medical advice is given unless the doctor has access to medical history and details. You can connect at [email protected] or WhatsApp 9640378378. I have H Pylori positive. can i use entergerminia at this stage, How much dose i can use for how much days? Consuming any drug beyond prescription limit can develop resistance in any one’s body. You must get a checkup done with the doctor to know if you can continue with the same drug. He might change prescription if you are not getting benefits from Enterogermina to avoid any drug resistance. My daughter was prescribed this medication along with Spasmoctyl. She has severe allergies to penicillin, milk, and tree nuts. Is this a safe drug? Please contact [email protected] to discuss this with doctor. i come to know about enterogermina from my colleague doctor who practice pediatrics.He prescribe for my 12 moth old grand daughter suffering a second episode of diarrhae just 4 days after the first episode of diarrhea. On first episode of diarrhea we give her syp cefspan 100mg one tea spoon full a day.She became alright but just after fifth day she again suffer of diarrhea. Feel free to contact us at [email protected] if you need to consult one of our panelist doctors. Once the vial is opened, should be consumed within 10 to 30 min of opening the vial. Hi, please have a look at the article – this section. Could you please let me know which types of Infectious Viruses / Diseases cured by Enterogermina?